Wow! Great job to each of you. Have a wonderful time in our nation’s capitol. Way to represent North Carolina Libraries! Libraries are important to our society and to humanity as a whole because they foster literacy, imagination and hope. As a young person I used to love to go to the library and roam the stacks. There were so many choices, and I could have any book I wanted. I could take one or usually more home or wherever I was going and enjoy them. Reading then was, and is now, such a pleasurable indulgence. It’s easy to take it for granted, but if you consider it, sitting down with a book is a very inviting and peaceful thought,(even with a horror story). In addition to books, libraries now provide access to many other types of resources. Most libraries have computers for patrons to use that have access to the internet. Many libraries offer or connect with community services to offer programs for the community, including computer training, tax preparation, legal advice, health education, job searching, and more. These can be of great benefit to the community and, in particular, a needed service for those who are at a socioeconomic disadvantage. And this brings me to one other thing that I have always admired about libraries (that is, in addition to the helpful, knowledgeable, and wonderful librarians that I have always come across). Libraries are for everyone. I have always felt comfortable in the library. Whoever you are, you are welcome. It seems like social barriers take a back seat there. The freedom to learn is a most basic tenant in America. Without free of access to books, other forms of literacy and communication, and the services of those who can help us do so (librarians are a lot like teachers), then the opportunity to learn becomes about the haves and have nots. 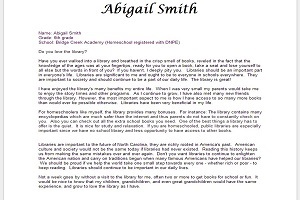 I have lived in North Carolina for 23 years now and used to take my children regularly to libraries all over our county. I continue to go to the library on my own and now that I am in library school, I am going several times a week. There is something special and unique about each library that I have been to, yet also many similar things. Some of these are excellent service, an environment that engenders a love of books, and a respect for all patrons. The libraries of North Carolina are doing important work in our community and helping many people. I hope this is more than enough cause for our state and federal legislators to understand the importance of supporting libraries! I have to agree, Michelle! I’m surprised, in a good way, at how engaged with libraries so many K-12 students are. It’s wonderful. Wow, what a talented bunch of students! I know you guys will “shake em up” in Washington.